Burnley boss Sean Dyche and AFC Bournemouth chief Eddie Howe should be considered for managerial awards according to Clarets striker Sam Vokes. The Welshman's two candidates for the Premier League Manager of the Season accolade, plus the yearly recognition granted by the League Managers Association, go head-to-head at the Vitality Stadium on Saturday safe in the knowledge that their respective clubs will be in the top flight next term. The 27-year-old, who was brought to Turf Moor from Wolves by Howe, initially on loan in November 2011, is confident that the showpiece will go to Antonio Conte, once Chelsea seal the title, but believes that the duo should be in the running. Howe was the recipient of the LMA award two seasons ago after engineering the Cherries' climb from the Championship while Claudio Ranieri scooped both prizes last year following a remarkable season with Leicester City. "I think they should definitely be considered," said Vokes. "They've both done fantastic jobs. They are two managers who have done well for smaller clubs in the Premier League and they've done it on a different budget. They've helped their clubs survive in a tough league against top quality sides. "I don't think they've gone under the radar but Conte will probably get it because winning the Premier League is massive. "The work they've done though is fantastic because bigger clubs have failed to survive at this level. It's a great achievement for them both. "I don't know how other managers will view it but the statistics and the success speaks for itself. The job we've done here is brilliant." 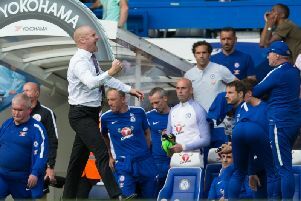 And Vokes feels the pair have enhanced the reputation of British managers in the English game. Dyche and Howe make up just under a third of the homegrown managers featuring in the Premier League but Vokes feels that number should be much higher. He said: "They've definitely enhanced the reputation of British managers. There wasn't too many at this level before and a lot was made of it. To have two British managers, like them, helping clubs survive in the Premier League is fantastic. "Clubs should look at British managers. It's a big thing. People talk about promoting homegrown players and that should be the same for managers. There have been a few who have gone on to be successful. I don't know why they'd look elsewhere." The Southampton-born striker progressed from the youth setup at Bournemouth and went on to score 16 goals in 54 appearances for the club in League One, playing in the same side as Howe. The club was relegated to League Two in 2008 after falling in to administration and was hit with a 17-point penalty for failing to follow the Football League insolvency rules. However, after becoming Jimmy Quinn's successor, Howe started to turn the club's fortunes around. "I'm looking forward to going back," said Vokes. "It's obviously where I started my career so it'll be quite strange returning. "To make it through as a youngster at the club was amazing. It was a good club at the time, in a bit of a transitional period. "I've got good memories of my time there. I was born in Southampton so it's my hometown. I'm from that area." Vokes added: "They had just been relegated to League Two when I left and they'd been deducted 17 points after going in to administration. At that point you feared for the club's survival. "They ended up going through some tough times but the club you see today is completely different to the one back then. It's really good to see them doing well. "The transformation under Eddie Howe has been brilliant and he's really turned the club around. "He's done an absolutely amazing job. The club was in real trouble. He did well as a player and now he's followed that on as manager. He's done great things for the club. "It's incredible to be going back there with both clubs in the Premier League. It's great to see how both clubs have grown." Whether either boss picks up an award for their outstanding achievements this season remains to be seen but Vokes will always hold a debt of gratitude for both. "They've both had a massive impact on my career," he said. "Eddie was a big reason for my move to Burnley. I'd worked with him previously and I really liked the way he went about things. "It didn't quite work out for him here but then the gaffer came in and we've had plenty of success. I have to give Eddie a lot of credit for bringing me here. "The gaffer now has been great. He put faith in me after I'd had a few loan spells and we've gone on to have a lot of success over the past few years. Survival this season is down to how he works."